With boom in bitcoin and expansion of blockchain based platforms, a private blockchain network was introduced by Multichain for Enterprises and finance sectors. 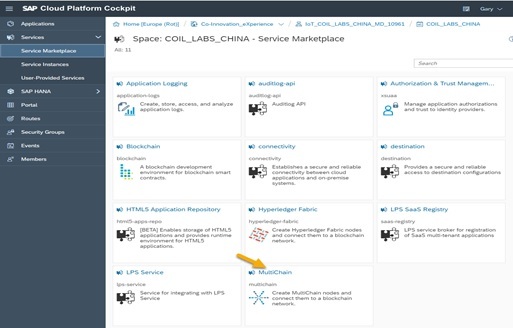 In this blog, we will explore multichain and how SAP has integrated it in to its cloud platform. Before we start with Multichain, please read What is Blockchain? Multichain is a platform which uses integrated management of user permissions to create private blockchains. It is derived from bitcoin. It supports Windows, Linux and Mac servers. Multichain was developed to overcome shortcomings of Bitcoin such as generic mining, privacy and openness. Private blockchains are the one that are controlled by single or multiple organizations that determines who can read it, submit transactions to it, and participate in the consensus or mining process. This brings both advantages and disadvantages with itself. Unlike Bitcoin, from which it is derived, Multichain does not depend only upon the concept of Proof of Work that can be owned by a single person in some situation. It uses a round-robin schedule, in which the permitted/authorized miners must create blocks in rotation to generate a valid blockchain. This scheme is implemented using a parameter called Mining diversity. Miners in Multichain neither charge transaction fees nor block rewards. Hence, transaction is free between two parties. But, a miner can charge a fixed service fee from the network participants. SAP too applies this type of fees and charge a fixed amount for a Block per hour. 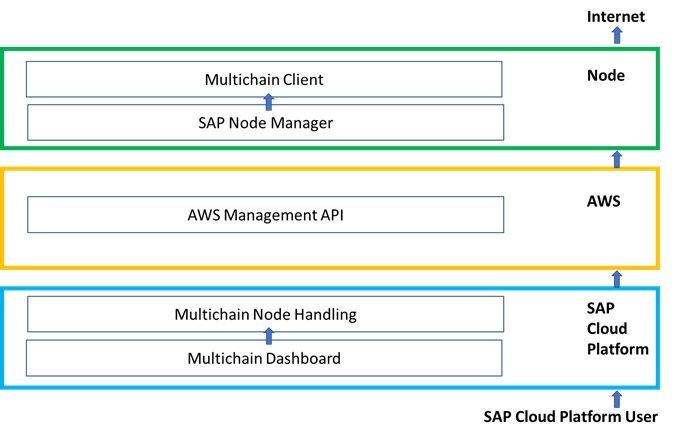 This is a generic architecture where it is shown how a MultiChain network is setup and how SAP Cloud Platform communicates with a MultiChain Node. To learn more about Multichain Architecture please refer the references. To Create a MultiChain on SAP Cloud Platform, initially we need to setup our Global Account on SAP Cloud Platform and create a MultiChain enabled sub-account. Then only we can proceed with development. 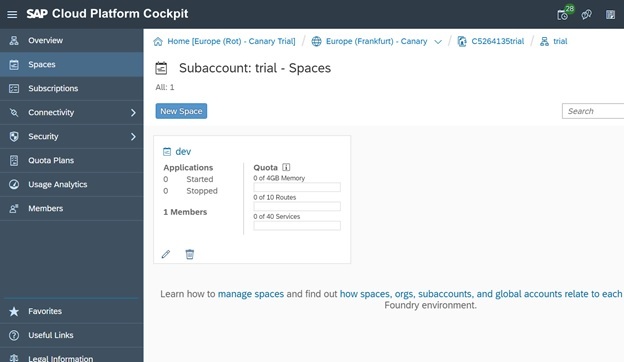 Step 01: Go to your SAP cloud platform [If you don’t have, go here and create one] and select region as Europe (Frankfurt). Once the initial setup of MultiChain is done, you can create your own nodes and instances. Follow Hands on Exercise to create your own SAP MultiChain service. trying to follow your instructions in step 01, but none of the three sites seem reachable from the US. are these services restricted to only certain geo’s? accounttrial.int.sap.hana.ondemand.com took too long to respond. ism.int.sap.hana.ondemand.com took too long to respond. int.controlcenter.ondemand.com didn’t send any data. Well this is something that should not happen. Let me know if these links are working for you or not. The links that I’ve added in my blog works fine for me(EMEA/ India). This global account does not yet have any subaccounts with an active Cloud Foundry environment. maybe, it would be easier to put a disclaimer on top of your blog saying that for certain trial accounts your instructions may not be applicable. in any event, everyone enjoy the multichain tile if they can use it. Great work, was able to successfully set up the environment and now ready for kick-off.